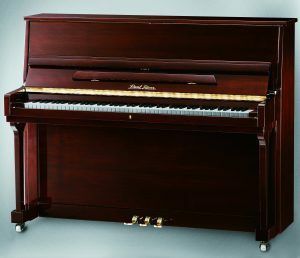 PEARL RIVER presents the most affordable quality piano available to day. Available in a choice of finishes these starter pianos offer incredible value for money and are made to a standard normally reserved for considerably higher priced instruments. Solid wood soundboards, sand-cast iron frames and UV polyester cabinets set PEARL RIVER specification apart. 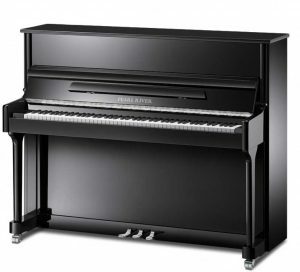 Elegant slim-line piano with a gently sloping top profile offering exceptional value for money. A larger soundboard and longer string length enrich the tone and dynamic range compared to other similarly priced pianos. The attractive cabinet includes a lockable keyboard cover. The perfect mid size offers balance of presence and performance suitable for players of all abilities. Contemporary, exceptionally good value family piano. Featuring chrome hardware, pedals and castors this model has a fresh, clean and attractive style. All Pearl River quality materials and processes are found throughout the pianos 8,000 moving parts, including vertically laminated bridges for durability and crown retention, a responsive action allowing for a broad dynamic range, and quality hardwoods. A professional instrument designed for those who demand the highest standards of tone, touch and durability. The larger soundboard surface area produces a tone comparable to that of smaller grand pianos and the action is expertly designed to allow for an inspiring dynamic range. Built to withstand heavy, professional use, the Pearl River 122 features solid hardwood legs and toe blocks with premium brass casters. Solid spruce back-posts with offset placement ensure superior tone balance and tuning stability. The key-bed has a solid spruce butcher block construction designed to withstand heavy use. Unique scaling by a European master piano designer matched with premium components and materials make the Pearl River 122 an exceptional instrument, ideal for teaching studios, performance venues and discerning pianists at all skill levels. 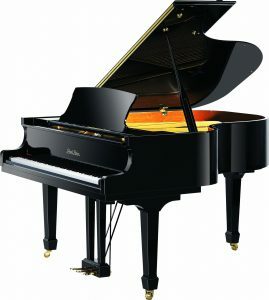 The PEARL RIVER 148cm / 4’10” baby grand piano is available in a choice of black or white high polish finishes. All the quality features of the Pearl River Baby Grand yet the benefits from extra string length and a larger sound board area resulting in greater depth of tone and performance. Elegantly proportioned the Pearl River 160 will bring classical ambience to your living room or have the projection needed for using in a school or small recital setting. 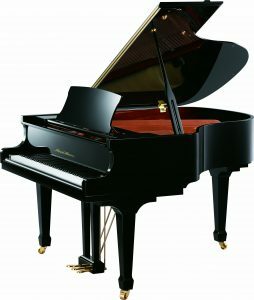 A truly professional grand piano due to solid design, long standing reputation and affordable price. This performance instrument is tailored for the domestic home environment, smaller performance venues or demanding educational requirements. With the tone of a concert grand piano but with more accommodating proportions, the Pearl River 188 is a popular choice for those seeking a larger grand piano with increased projection of tone, yet at an affordable price. Pearl River Piano Group acoustic piano brands Pearl River, Ritmuller and Kayserburg are represented in the United Kingdom and Republic of Ireland exclusively by Piano Imports Ltd.